Motion sensor-activated stair lighting that lights up your stairs automatically when you enter the staircase area. The kit contains all that you need: individual stair lights, motion sensors and smart controllers which switch the lights on and off again, saving energy and reducing your electricity bill. The light for each step is 90 cm wide. We also sell a 60 cm version. The guide below has more information on the options available. We know choosing your options can be a complex process and we’re here to help! If you would like help in establishing the stair light options that are right for you, or if none of our standard options suit your needs, contact us for support or a custom quote. Please choose your preferences then select your choices here. We will ask your colour, profile and motion sensor preferences as you check out. Control unit - we offer two types of control unit or we can supply lights without a control unit if you'd prefer to use your own. 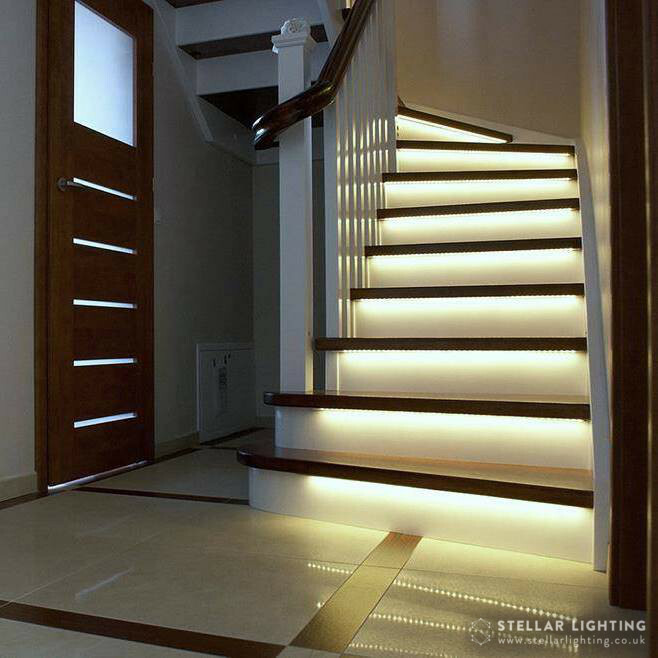 LED stair lighting strips. Each set can contain 1-21 steps, meaning you only buy the number of lights you need, reducing wastage and cost. Aluminium profile and end caps for each light strip, in a choice of colours. Motion sensors, in a choice of three styles. Timer - optional. A programmable timer means you can set the hours that the Intelligent Stair Lighting set is active. Delivery is included. Your stair lighting set should be with you in 7-12 days. The options available to you are shown below. Suitable for flights of stairs comprising 6-21 steps. Intelligent Stair Lighting is available in three shades of white light (cool white, neutral white and warm white) and red, green or blue lights. Please note that you will be asked for your choice of light colour at the checkout stage. Please note that you will be asked for your choice of profile (shape and colour) at the checkout stage. Standard fitting which can be mounted even on finished stairs. The profile is hidden in a cut under the step. A popular choice for customers who have not finished their stairs yet. Mounted in the corner between the stair tread and the riser. Profiles are available in six colours: black, white, gold, silver, pine effect and wenge effect. A diffuser covers the light strip to provide an even glow along the length of your Intelligent Stair Lights. There is a choice of two finishes, transparent and milk. Please note that you will be asked for your choice of diffuser at the checkout stage. Transparent The transparent finish lets the most light through. Milk The milk finish is a translucent cover that gives a soft glow. Intelligent Stair Lighting motion sensors are fitted at the top and bottom of the staircase and switch the lights on when someone passes them directly. They do not activate if you walk by the stairs, which can be the case with other sensors available on the market. 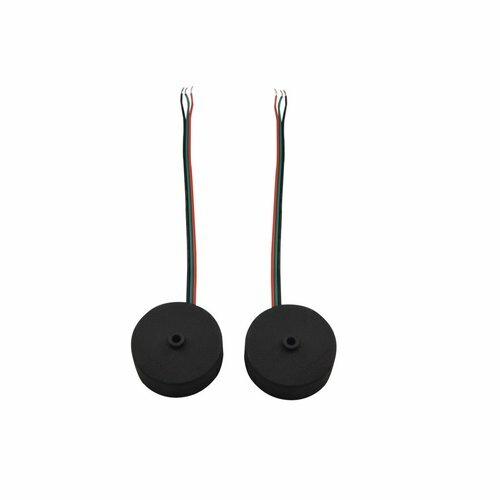 We offer a choice of three motion sensors, suitable for different installations. Please note that you will be asked for your choice of motion sensor at the checkout stage. Our downloadable product information sheet (PDF) provides more information on the options available. Intelligent Stair Lighting Installation Instructions (PDF) give a step by step guide to fitting your stair lights. The Control Unit Programming Manual (PDF) covers the steps of setting up your controller. See also our video installation guide for controller SCR2.